A scattered assemblage of bones found at the Denmark site. 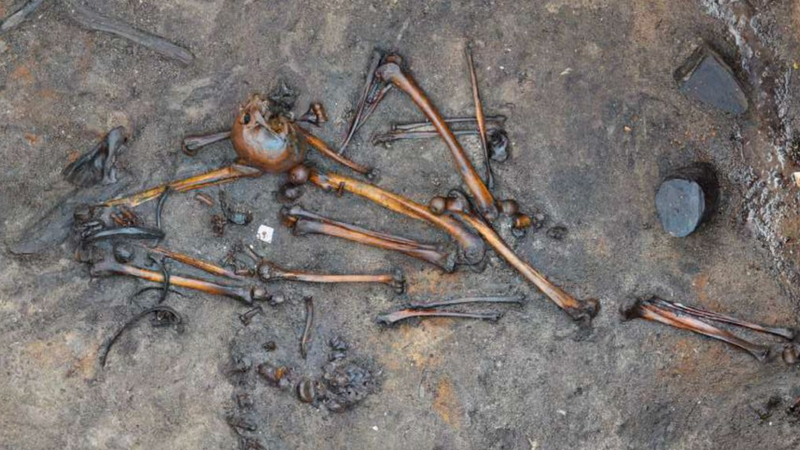 To the victor go the spoils, or in some cases, the bodies of a vanquished enemy, as the discovery of remnants from an Iron Age battle in Denmark demonstrates. New research published this week in Proceedings of the National Academy of Sciences shows that Alken Enge, a 185-acre archaeological site in Denmark’s Jutland peninsula, was the site of a gruesome battle some 2,000 years ago. Digging through the marsh, a team led by Mads Kähler Holst from Aarhus University uncovered 2,095 bones, representing at least 82 individuals. The archaeologists haven’t been able to excavate the entire site, but based on what they’ve seen, they estimate that around 380 individuals were involved. The finding represents a previously unknown and surprisingly large battle that happened at the dawn of the first century AD and featured a post-battle ritual not seen before among Iron Age Germanic tribes. Some six to 12 months after the battle, somebody—possibly the conquerors—dismembered the partially decomposed fallen warriors, crushed their skulls, and arranged their bones onto tidy piles. In one extreme case, four pelvic bones were strung together on a tree branch. Eventually, the remains were tossed in a nearby lake, some weighed down by stones that were brought in from far away. The incident happened in a Germanic region of northern Europe during the Roman Period, but the exact identity of the tribes and the people involved is unknown. The violence imparted onto the dead suggests it was done to flaunt the victory and demean the vanquished, but the exact purpose of this “organized and ritual clearing of a battlefield” remains unclear. Human bones held down by two small stones. The 2,095 bones were found beautifully preserved in peat and lake sediments, and they belong almost exclusively to males. Most were adult men, but some were as young as 13 and 14 and as old as 60. Eleven bones were classified as female, which suggests some women participated in the fray. Radiocarbon dating places the battle to between 2 BC and 54 AD—a tumultuous time when the Roman Empire embarked on northern expansion, and rival and increasingly militaristic Germanic tribes frequently clashed. Red marks indicate distribution of injuries. With no written records of the incident, it’s difficult to know, but it’s possible that Roman soldiers, fresh from their crushing defeat at the Battle of the Teutoburg Forest, slaughtered this Germanic tribe as part of the Roman Empire’s ensuing punitive campaigns. Indeed, the incident happened at the peak of Roman northward expansion, which was often met with ferocious local resistance—and why Romans referred to their not-so-friendly Germanic neighbors as “barbarians.” The battle site at Alken Enge could very well be the remains of one of those punitive campaigns. Four femurs threaded onto a stick. That said, there’s absolutely no physical evidence to suggest Roman troops were involved. All weapons recovered from the site were made with the local Germanic style, and the absence of healed injuries on the dead suggests the soldiers had very little previous battle experience. Peter Bogucki, a Princeton University archaeologist who wasn’t involved in the new study, told to National Geographic that it was likely “barbarian-on-barbarian” action. Indeed, the evidence uncovered at this site points to the growing militarization of the Germanic regions at the time. The size of this army was disproportionate to the typical size of Germanic Iron Age villages, which suggests newfound organization and leadership, and the practice of recruiting soldiers from far away. As to why the bodies were dismantled and arranged in such a specific way, that remains a mystery. But the stringing of the pelvic bones on a branch may have been some form of sexual humiliation, the researchers write. These kinds of “trophies” are not uncommon, with other examples appearing elsewhere in history. Did a Poem About a Horrific Volcanic Eruption Destroy the Norse Gods of Iceland?